Anger management therapy helps with immediate measures to start effectively managing destructive outbursts of rage. 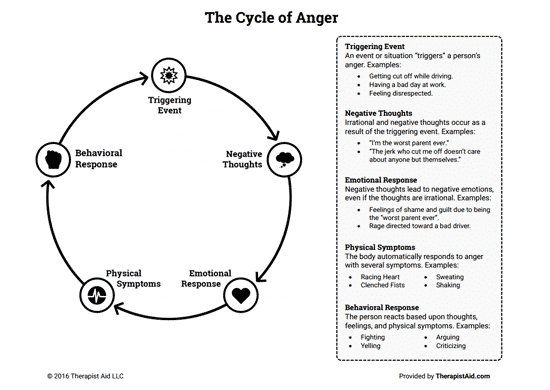 Learn to break out of the endless cycle of anger and feel calmer and more at ease. Learn the causes of your anger. Only by understanding the source of your anger can you reduce the intensity with which you feel it. It then becomes much easier to control the accompanying behaviour. How do I allow others to enrage me? How do I wind myself up? How did I experience anger in my family? What effect does my anger have on my loved ones? Do your anger issues make you angrier still? Are you ashamed of your behaviour? Through Anger Management Therapy, learn simple alternatives to express yourself so that you strengthen relationships rather than damage them. Changing your behaviour changes how you feel about yourself and how you interact with those closest to you and the world in general. Learn to express your feelings and needs positively and start to transform the most important relationships in your life.